What Is The Definition Of Leg Before Wicket In Cricket? 1. 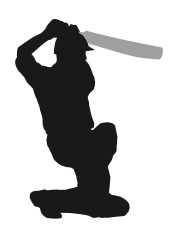 A dismissal of the batsman due to the ball striking any part of the batsman’s body (except the band holding the bat) instead of the wicket. This is ruled by the umpire after an appeal by the fielding team, and the call is made if the umpire judges that the ball would have struck the wicket if not intercepted by the batsman’s body. 1. The umpire ruled that the batsman was out leg before wicket.